Delores Jackson Radney leads children in song. February 8, 2017 - Young Audiences of Rochester and the Settlement Houses of Rochester Foundation have partnered to offer arts education. The Urban Arts Education Alliance will provide arts experiences to early childhood, at-risk teens and senior citizens at the member organizations of SHRF. Arts education will be provided at Baden Street Settlement, Charles Settlement House and Community Place. 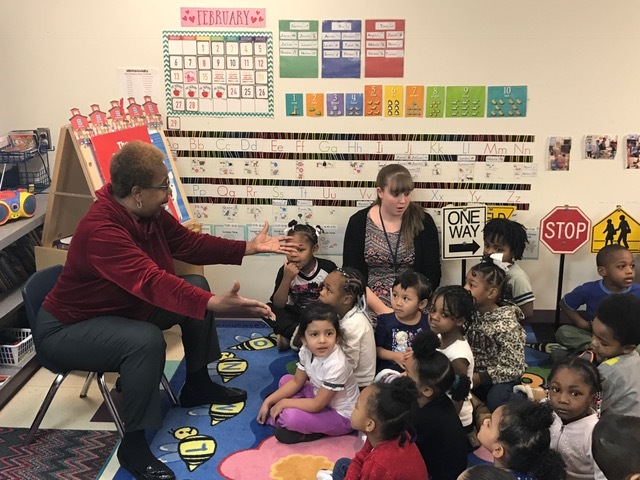 During a press conference at Baden Street Settlement's Alvin Wesley Child Development Center, artist Delores Jackson Radney led children in song and storytelling. Many residents of urban areas do not have access to arts experiences. Schools have limited arts programming. Residents may not have the means to pay for museums and classes. The Urban Arts Education Alliance will fill in this gap, inspiring generations of individuals who rely on the settlement houses to enrich and uplift their lives.